Could coffee be a geroprotector? 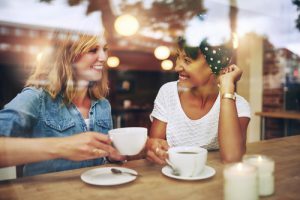 Many people like to start the day with a hot cup of coffee to help get their motor running, but there could be more to this popular beverage than meets the eye. Nothing quite like the taste of hot fresh coffee and it is no surprise it has been the drink of choice in many cultures for centuries. Coffee has also long been associated with having geroprotective properties, meaning it is a substance that protects against the aging process. A number of epidemiologic studies suggest that drinking coffee can reduce the risk of Alzheimer’s and Parkinson’s disease. 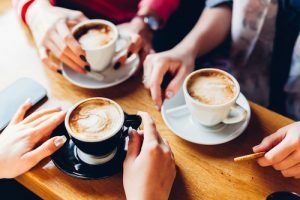 Based on the cardiovascular risk factors, aging and dementia studies, the consumption of 3-5 cups of coffee a day is associated with a reduced risk for Alzheimer’s in later life. 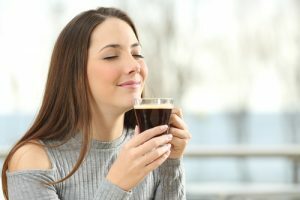 Some studies have suggested the reason coffee is beneficial is due to caffeine and its antioxidant properties, however a study in 2015 found there was no significant difference between caffeinated or decaffeinated coffee so something else other than caffeine must be responsible for its protective properties. One group of researchers at the University of British Columbia in Canada wanted to determine the reasons why this might be so they launched a study to explore the geroprotective properties of coffee. Today we are going to take a look at the study, methods and the conclusion the researchers reached (1). The researchers knew from previous studies that the most likely active compounds in coffee with antioxidative and anti-inflammatory properties were quercetin, flavones (flavonoids), chlorogenic acid, and caffeine. The researchers measured the typical amounts of each of these compounds contained in 100 grams of coffee beans which showed the following: 280 mg of chlorogenic acid, 200 mg of quercetin, 60 mg of flavones and last caffeine at a mere 40 mg. This means that caffeine accounts for a much smaller amount in comparison to the levels of quercetin, chlorogenic acid and flavones in coffee. Having determined the most likely active compounds – quercetin, flavones, chlorogenic acid, and caffeine – the researchers tested their effects on neuroinflammation and neurotoxicity using SH-SY5Y cells. The SH-SY5Y cell line are human derived cells commonly used in in-vitro testing as models of neuronal function and differentiation. The research team tested the prevention of neurotoxicity in human SH-SY5Y cells that were induced by lipopolysaccharide plus interferon-g or interferon-g released from activated microglia and astrocytes. This causes inflammation and neurotoxicity and is the ideal model to test the protective properties of compounds with. The experiment showed that caffeine only had neuroprotective and anti-inflammatory effect at very high doses (at least 100 mg/ml), this is considerably higher than the levels found in coffee. Furthermore the results showed no significant difference between coffee with or without caffeine. However, quercetin was a far different story. The tests showed quercetin protected the SH-SY5Y cells after they were exposed to LPS/IFNg-stimulated microglia and IFNg-stimulated astrocytes. This neuroprotective effect was dose and time-dependent. The research team also noted that quercetin also inhibited activation of P38 MAP kinase and the NF-kB protein complex, these are key regulators of inflammatory responses in the body and their overstimulation is implicated in numerous pathologies. Flavones and chlorogenic acid also proved more effective than caffeine though quercetin was the clear winner having the most significant effect. Quercetin also has antioxidative properties which the researchers noted lead to a reduction in levels of 8-OHdG. 8-OHdG is a biomarker indicating oxidative damage to DNA and so its decrease is another positive sign that quercetin has protective properties. The research team discovered that quercetin reduced the increase of protein carbonyls, a biomarker for oxidative damage to amino acids in proteins. The researchers showed that quercetin reduced the level of lipid peroxide, this is produced when reactive oxygen species attack the unsaturated fatty acids in lipids. Finally quercetin also reduced the presence of 3-nitrotyrosine, produced when reactive nitrogen species attack the body. It should be noted that caffeine showed absolutely none of these antioxidative effects. The researchers also showed that flavones and chlorogenic acid also have an anti-inflammatory and neuroprotective effect although this was significantly weaker than quercetin. Taken together the data strongly suggests that quercetin is the major neuroprotective and anti-inflammatory component in coffee and not caffeine. Drinking 4-5 cups a day could prove beneficial as a preventative for Alzheimer’s and Parkinson’s disease. However, it is worth bearing in mind that the level of quercetin present in an average coffee is relatively low compared to the dosage found in dietary supplements (typically 500 mg). So it might be worth considering adding quercetin or better still isoquercetin to your supplement regimen along with your morning coffee to maximize the benefits. Tests show that isoquercetin is a more potent form of quercetin with better bioavailability and absorption (2) and is also readily available as a dietary supplement for a relatively low cost. As with all supplements you should consult your healthcare provider before you begin taking a new supplement. So there you have it, the next time someone suggests that you drink too much coffee you can tell them, “you are probably not drinking enough”. (1) Lee, M., McGeer, E. G., & McGeer, P. L. (2016). Quercetin, not caffeine, is a major neuroprotective component in coffee. Neurobiology of aging, 46, 113-123. (2) Paulke, A., Eckert, G. P., Schubert-Zsilavecz, M., & Wurglics, M. (2012). Isoquercitrin provides better bioavailability than quercetin: comparison of quercetin metabolites in body tissue and brain sections after six days administration of isoquercitrin and quercetin. Die Pharmazie-An International Journal of Pharmaceutical Sciences, 67(12), 991-996.